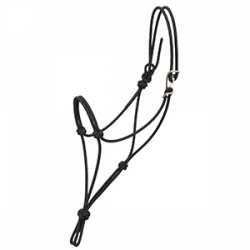 This best-selling, one-piece design with clip is the preferred choice of trainers, clinicians, outfitters, trail riders, working cowboys and riders from all disciplines. Hand-tied from 5/16" polypropylene 16-strand diamond braided rope of medium-firm lay that holds its shape. Product tag includes easy-to-follow instructions. Handcrafted by Weaver Leather craftspeople in Mt. Hope, Ohio.